Transform feedback into insight with LearnRT. This module lets you know where brand loyalty is gained or lost with powerful analysis and reporting tools. Explore reports, dashboards and scorecards, and put customer feedback at the center of your business. Access trends and macro reports at the line of business or division level, or drill right down to the customer or employee level to review individual feedback. No matter what you want to discover, you’ll have real-time knowledge at your fingertips. 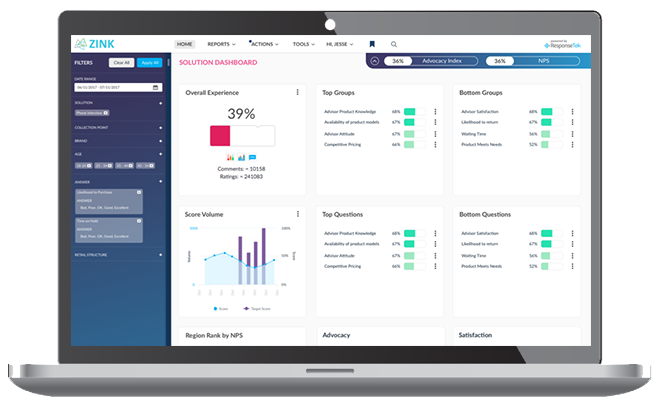 We provide real-time access to role-based reporting so your teams can access customer insights as soon as survey results are received. Additionally, because not all employees have access to a desktop computer, we have mobile-based reporting and push alerts to keep everyone plugged into feedback all the time. 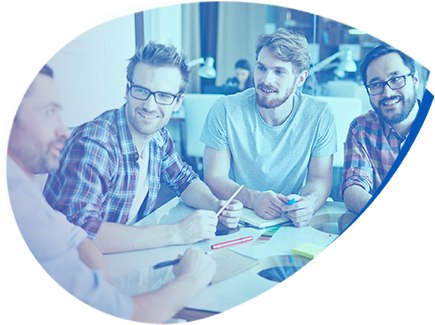 Specific to individual employees and interactions, each report lets every member of the organisation see how they’ve performed in the eyes of the customer, allowing them to discover and address areas for improvement. Without the right solution, text comments are difficult to consume and act on. 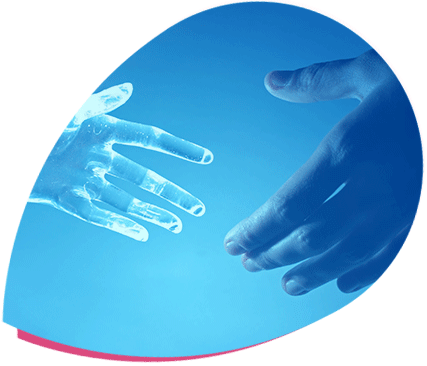 The ResponseTek Listening Platform collects both quantitative and qualitative Voice of Customer feedback. From structured data, all the way to open-ended answers, our cutting-edge technology harnesses Natural Language Processing (NLP) and machine learning to help you quickly understand what customers are saying. It’s easy to use, intelligent, and will help you immediately identify important trends, sentiment and learnings that you can spread across your organisation. Click here to learn more. Make customer feedback easy to access and understand, and you’ll have long-term program success. 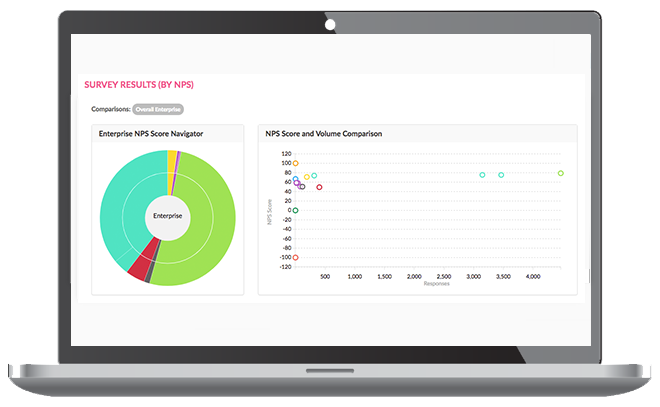 With the ResponseTek Listening Platform, customer insights are displayed in visually appealing, interactive formats, making it easy for your teams to access them and drill down deeper when needed. Little training is required to get your staff using the Listening Platform because it’s interactive and simple to operate, yet powerful at filtering analytics for users in any role. To get to the beating heart of true customer-centricity, the right information must be delivered to the right person at the right time, automatically. Through ResponseTek’s push reports, notifications, action alerts and follow-up reminders, you create a customer-centric culture based on the Voice of the Customer. This lets all members of your team gain a clear understanding of what’s working and what’s not from the customer’s vantage point. Executives need different insights than frontline managers. That’s why reports are customised and tailored with the metrics that are relevant to each role. With ResponseTek, these metrics come in the form of operational scorecards, team-based rankings, trend analysis and metric comparisons. With strict security rules and hierarchy management, program managers gain the confidence to deliver customer insights throughout the organisation while adhering to security policies and privacy regulations. To have a truly effective CEM program, customer feedback must live inside multiple channels, lines of business or product offerings. 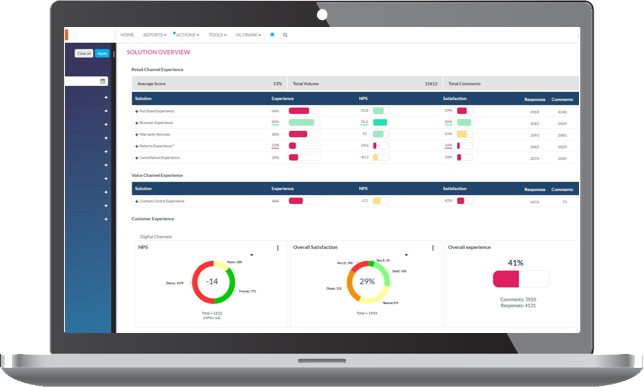 Our platform empowers a holistic view of all your surveys, data, feedback and insights, letting your organisation track, measure and analyse what customers are saying through all channels and touchpoints. You can monitor the entire customer journey, while learnings and insights flow to different teams for a comprehensive view of performance and areas in need of improvement. 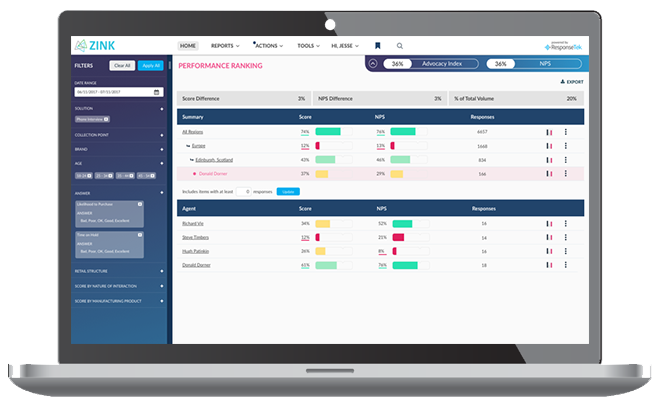 With standardised metrics and analytics you can also benchmark and improve organisational alignment while decreasing costs because you won’t have to deal with multiple feedback vendors. Having your customer data in one place for real-time use is now easier than ever with our new API Library capabilities. Our newest update to the API library enables you to link your enterprise software solutions (ex. 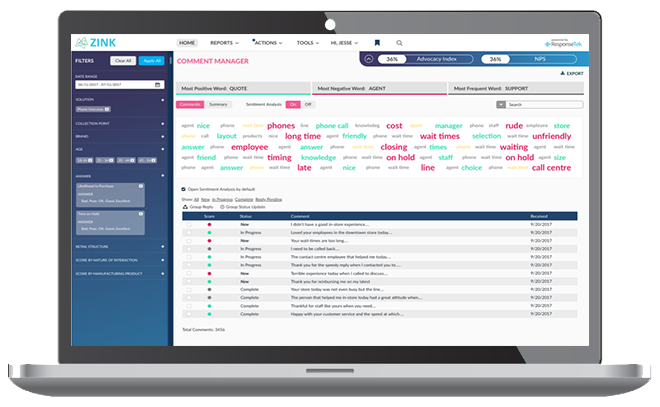 CRM or customer service systems, marketing automation systems, etc) to the ResponseTek Listening platform, allowing you to analyze customer experience insights all within your enterprise software platform. Integrating survey results equips your front-line staff with the knowledge to make a difference – at the moment it matters. Knowing whether your customer is a detractor or promotor gives employees the power to close the loop on a negative interaction, or up-sell after a positive one.